Description Ultratech is a very powerful mega-corporation (entities which, in this future setting, replaced all governments) which organizes a tournament called Killer Instinct. Along with regular participants, experimental creatures created by Ultratech also fight in the tournament. Ultratech also discovers a technology to make bridges between dimensions, and to also release from this dimensional prison a two-headed monster called Eyedol, an ancient warrior that was locked away along with his rival. Fulgore. Fulgore is a cyborg, part of a cybernetic project developed by Ultratech, the masterminds behind the Killer Instinct fighting tournament. Fulgore was entered into the tournament to test its fighting capabilities. If successful, the Fulgore unit would be placed in mass production. During the first Killer Instinct tournament, Fulgore met its end at the hands of Jago. A newer version of Fulgore was produced for the second fighting tournament. Fulgore has two No Mercy moves, one in which it removes its head, revealing a large turret-like gun which shoots the enemy repeatedly. The other uses a laser beam from its eyes to reduce the opponent to ashes. Cinder. A criminal who was promised early release by Ultratech in exchange for participating in chemical weapons research. As a result of an accident during testing, his body is composed entirely of flame. He is promised a return to his original form if he is able to defeat Glacius in the tournament. In the early development stages of the game his name was Meltdown, but this was soon afterwards changed to Cinder. Cinder has two No Mercy moves, the first creates a pool of magma under the opponent, who melts into it. The second shoots them with flames to reduce them to ashes. Glacius. An alien who was captured by Ultratech and promised freedom if he wins the tournament. He gets his nickname from his body's icy liquid composition and ability to shape-shift. He uses three different No Mercy moves, one where he becomes a gel-like mass and absorbs the opponent (similar to the Blob), one in which he uses his finger as a syringe to inject the enemy with a substance that turns them to ice, and the last of which he turns into a pool of boiling water that the enemy drowns in. Jago. A Tibetan monk following the Tiger Spirit, he is on the path of enlightenment to defeat the evil within him. He believes it is his destiny to destroy Ultratech. He has many of the same moves as Street Fighter's Ryu and Ken characters, including the fireball and spinning uppercut. His No Mercy moves consist of stabbing the enemy with his sword, and meditating, which causes a car to fall on the opponent. Riptor. A genetically engineered velociraptor-human hybrid created as a prototype by Ultratech. The tournament serves to test its abilities as a killing machine. It has three No Mercy moves. One in which it spits acid on the enemy, one in which it stabs the foe with its tail, and one in which it runs at the enemy, and eats it's opponent. Sabrewulf Count Von Sabrewulf is stricken by lycanthropy, and is promised a cure by Ultratech if he wins the tournament. This is a semi-cameo appearance of Sabreman, known from Rare's 1984 game Sabre Wulf. Sabrewulf fights in his inherited castle as his home level, with biting and claw attacks, and the ability to howl and use his Flaming Bat. He has two No Mercy moves, one where he slams the foe into the screen, and one in which he stabs the enemy with an elongated claw. TJ Combo. A former heavyweight boxing champion for 5 years. He was stripped of his title and kicked out of the circuit when it was discovered that his arms had cybernetic implants which greatly helped his boxing ability. Ultratech promises him to return his title if he wins the tournament. Combo has two No Mercy moves, one where he snaps the opponent's neck, and the other he punches the opponent into the screen. Chief Thunder. A Native American Chief, armed with twin tomahawks, who enters the tournament to find out what happened to his missing brother Eagle in the previous year's tournament. He has two No Mercy moves, one where he calls down a bolt of lightning to smite the enemy, and the other in which he knocks the opponent into the air, leaving their shoes/feet behind, depending on the character. B. Orchid. Hired by Ultratech as a secretary, she is actually a spy working for an unknown party and, along with Jago, appears to be the heroine of the game franchise. Her full name is Black Orchid. She has two No Mercy moves, the first in which she gives her opponent a heart attack by unzipping her uniform and flashing her breasts, and the other in which she transforms the opponent into a frog, then (at the player's option) stomps on them. Eyedol. A two-headed, ancient mystical warlord who was trapped in a dimensional prison in the distant past. Ultratech released him to be the final combatant in the tournament. 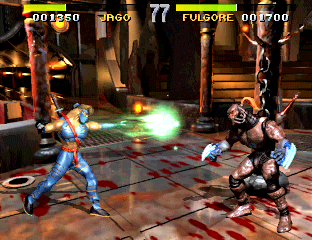 It is shown in Killer Instinct 2 that the person Eyedol was trapped in combat with was Gargos, the final boss of that game. For some reason, the game designers did not give him any No Mercy moves, ultra combos, or humiliations. 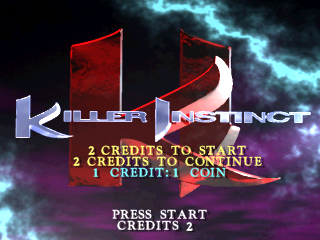 Automatic combos: rather than press the necessary buttons in order to deliver the individual attacks that form a combo, in Killer Instinct the combos are automated and can be enabled by inputting a determined button or special move (which led to the character to deliver a string of hits). Finishing moves: Largely inspired by Mortal Kombat's Fatalities, each character has at least two moves known as No Mercy (Danger Move in later revisions) in order to finish the opponent in a violent manner. One of these No Mercy moves can be executed at the end of a combo (which is labeled as an Ultimate combo), when the opponents life bar flashes red (when his or her second bar is going to be depleted), although it uses a different combination movements. Another finisher is the Humiliation, that forces the opponent to dance (the dance style depends on the character), but this can only be used if the player has his or her first life bar. Ultra Combo: Another finisher, it operates like an Ultimate combo, though this one allows the character to deliver a long string of hits as the combo finisher instead, usually surpassing 20 hits. Combo Breaker: The player who is being caught in a combo may break out of it by performing a combo breaker move. The combo breaker is a designated special move of the player's character. A combo can be broken at either the auto-double or linker stage. To successfully break an auto-double, the player must use the breaker move at a strength lower than the auto-double itself (i.e. for a player to break a Medium auto-double s/he must use a Quick breaker.) The combo can also be broken at the linker stage. At this stage the player can use any strength of breaker, making long combos a risky affair. Also, after performing a combo breaker, a white starburst will appear at the tip of the breaker's health bar, enabling advanced versions of some special moves that require a different command, i.e. Jago, instead of a regular green fireball, can shoot a red fireball.